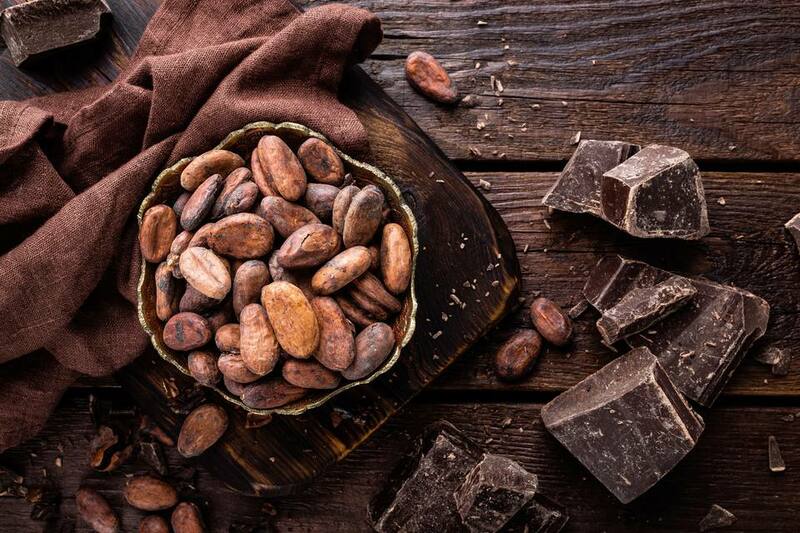 Cocoa beans have a complex journey from jungle trees to foil-wrapped confections. Here is a simple breakdown of the steps involved in the cocoa making process. Chocolate begins with Theobroma Cacao tree. Pods from this tree are harvested for the making of chocolate only once fully ripened. Unripened pods yield beans with a low cocoa butter content and low sugar content. The natural sugars in cocoa beans fuel the fermentation process, which is responsible for much of the classic cocoa flavor. Once harvested, the seeds are separated from the pods and pulp and allowed to begin the fermentation process. Raw cocoa beans have a bitter and undesirable flavor. Fermentation transforms this bitterness making it into the more complex precursor to the classic cocoa flavor we are familiar with. Fermentation is achieved with natural yeast and bacteria that are present on the cocoa beans. The beans are simply left out in the heat and moisture to ferment for approximately seven days. After fermentation, the beans are quickly dried to prevent mold growth. After fermentation and drying, the beans are thoroughly cleaned and removed of any sticks, stones, or other debris. Cocoa beans are typically roasted using the dry roast method, which employs constant stirring to ensure even heating. Dry roasting does not require the addition of extra oils or fats, which allows the flavor to stay pure. This is the final step in creating the classic cocoa flavor that we are all familiar with. After roasting, the hull is removed from the bean and the inner nib is extracted. The nibs are then ground into a fine powder, which contains cocoa solids and cocoa butter. The cocoa butter usually liquifies from the frictional heat while grinding the nibs. This liquefied form of pulverized cocoa nibs is referred to as cocoa liquor. Cocoa liquor is then poured into molds, allowed to cool, then sold and transported in these blocks. These blocks are known as unsweetened or bakers chocolate. Alternatively, cocoa liquor can be separated into two products, cocoa powder, and cocoa butter. Cocoa liquor, baking chocolate, cocoa powder, and cocoa butter can be blended with various ingredients to create an endless number of cocoa products. To produce the chocolate candies which we are all familiar with, cocoa liquor is combined with extra cocoa butter (for smoothness and mouthfeel), sugar, milk, and sometimes vanilla, emulsifiers, or stabilizers. The ratio of sugar and milk to cocoa creates varying degrees of milk or dark chocolate. The specific ratio in which ingredients are blended creates signature recipes, which specialty brands often guard closely. Although chocolate manufacturers have lobbied to allow the use of hydrogenated vegetable oils, milk substitutes, and artificial flavors to be used in the making of chocolate, the USDA still does not allow the term "chocolate" to be used for products containing these ingredients. Only products made with real cocoa liquor (or a combination of cocoa solids and cocoa butter) may be called "chocolate." Cocoa powder, cocoa butter, and cocoa liquor are also used to make many products besides chocolate candy. Cocoa is used in a variety of savory dishes, especially in Central and South America. Cocoa butter is a prized ingredient in many skin products because of its skin-softening qualities.